This NRSWA training course on signing, lighting and guarding during an excavation on the highway includes legal requirements, risk assessment, speed control. This course is suitable for people who need to gain knowledge and understanding of the legal requirements to enable them to follow the procedures for setting out Signing and Guarding of a working space on the Highway. 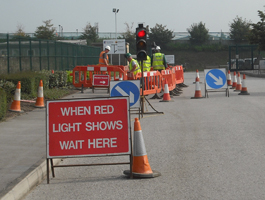 To provide you with the skills and knowledge necessary to sign, light and guard street works and road works in line with the revised 2002 Code of Practices. Training is completed both in the classroom and on site. Upon completion of the course, you will receive a CABWI/SQA certificate and an SWQR card which is valid for five years.